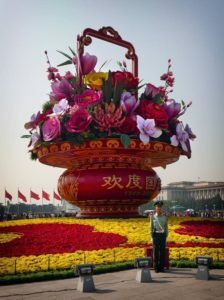 After stretching out on a half empty flight from London to Hong Kong twenty one keen trekkers arrived in Beijing’s impressive airport built for the 2008 Olympics. All bags accounted for our local guide James and trusty bus driver Mr Lee took us to dinner in a local restaurant before crashing into bed in our downtown hotel. The next morning gave us our first taste of the horrendous Beijing traffic. With a population of over 21 million people and 5 million cars the city has just embarked on a five year plan to try and resolve the gridlock. The crawling traffic did however give the ever patient James the opportunity to try and teach us some Mandarin – it seems intonation is vital – you can either end up ordering two beers or insulting the barman’s mother! Three hours later we arrived at Huangyaguan in the countryside north east of Beijing and had our first glimpses of the wall clinging precariously to the surrounding mountain ridges. Checking our bags into our hotel for the night, an atmospheric converted fort right next to the wall, we set off for an introductory 2 hour walk on a well preserved section of wall passing the beautiful “Heroine’s tower” reputedly built using money donated by the widows of twelve men who died building the Great Wall. All in all a good opportunity to stretch muscles in readiness for the next day. 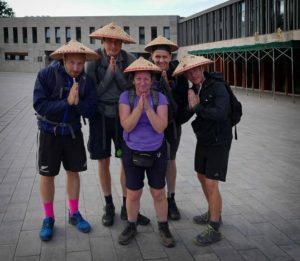 The next day saw the challenge proper start with the group sweating their way to the top of the mountains towering over the hotel. Ninety minutes of climbing a steep section of the wall followed by Heaven’s ladder – a staircase of 200 odd stone steps, renamed Hell by some of the more breathless amongst us – was rewarded with amazing views of distant watch towers poking through a beautiful cloud inversion. Continuing along trails running over narrow vertiginous sections of crumbling wall and hugging mountainsides we reached our lunch stop at a picnic site next to a new hostel being built in the forest complete with a bizarre vending machine dispensing coca cola and chicken feet! A lovely few hours walk through the forest following a completely unrestored wall saw us reach a couple of old watchtowers and a steep walk down a path to reach the mountain village where we were to spend the night. The simple hostel slept three in a room with our very own “Inbetweener” lads sharing a large traditional concrete bed for four – good for bad backs! Some great local food was followed by a few well earned beers around a campfire and karaoke “entertainment” from some tone-deaf locals! 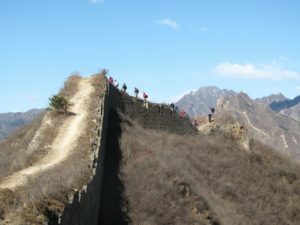 The next morning brought a walk upwards in the sunshine through orchards and vegetable patches to reach the remains of the wall as it followed the ridge to the “three counties” viewpoint where a number of rather vocal and friendly Chinese trekkers photobombed our group pictures. Our circuit brought us back to the village square and its 300 year old Chestnut tree before a walk out on the road to meet up with Mr Lee and the bus transfer to Jinshanlin. 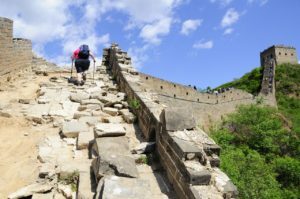 The next two days saw us trekking along arguably the finest sections of the Great Wall. With over thirty watchtowers and steep gradients giving ever changing perspectives and wide open views the group took hundreds of photographs of sinuous Wall snaking its way over the ridges of the Yanshan mountains. Despite some wasp stings and a lengthy detour around a blocked off section of Wall overlooking a military base a long hot day was celebrated in the “Corner Pub” next to the hotel. 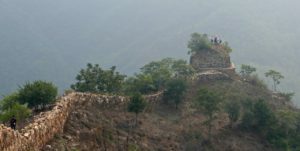 The next morning a mist enveloped the Wall lending it an air of mystery as we continued to push ourselves up ever steeper gradients and the 102 steep steps up to “Oh My God” tower, all the time accompanied by our “shadows” fanning us and hawking their souvenirs. Another bus transfer took us to Mutianyu and a tough couple of hours walking the next morning through Chestnut groves and forest to reach the wall on a high isolated ridge with distant views through the haze of the Beijing tower blocks. After lunch we set off downhill on this beautiful section with its elaborate brickwork and crenellations with some of the watchtowers being decorated with animal statues and tablets bearing calligraphy above some entrances. The end of the day saw the option of walking down, taking a cablecar or, for the more adventurous, a lengthy and fast toboggan run down the mountainside. At the bottom awaited souvenir shops where haggling skills were put to the test as hats, scarves and ninja weapons were purchased! 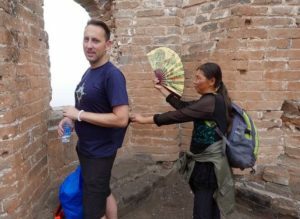 The next day saw a short bus transfer to our final section of the Great wall at Huayagong. 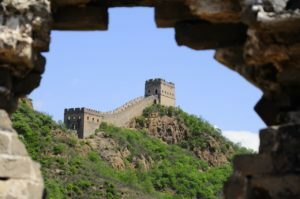 This part of the wall is the most accessible from Beijing and therefore can get very crowded. Our guide James suggested we walked the less popular section and whilst we shared the Wall with more people than we had all week it wasn’t as frenetic as it could have been. With step climbing muscles by now in peak condition the group made short work of the climb to the highest point and after a look around a gift shop and some more photobombing by locals there followed a leisurely stroll back down to the lake and the opportunity to toast our achievements with finest Chinese Champagne! After braving the Beijing traffic and stopping for a well earned massage we arrived back at our city centre hotel with just enough time to get ready for what turned out to be a superb dinner in one of the city’s finest Peking Duck restaurants and a helpful lift in the bus from Mr Lee to continue the celebrations in “Bar Street” where we soon learned the trick was to haggle down the price of drinks before going in. Nursing some sore heads our last morning in China saw James give us a guided tour of Tiananmen square and the Forbidden City before most of us headed back to the UK with some extending to see the Terracotta Warriors in Xi’an. A great experience with a great group. Many congratulations Team Tesco – you did yourselves proud!